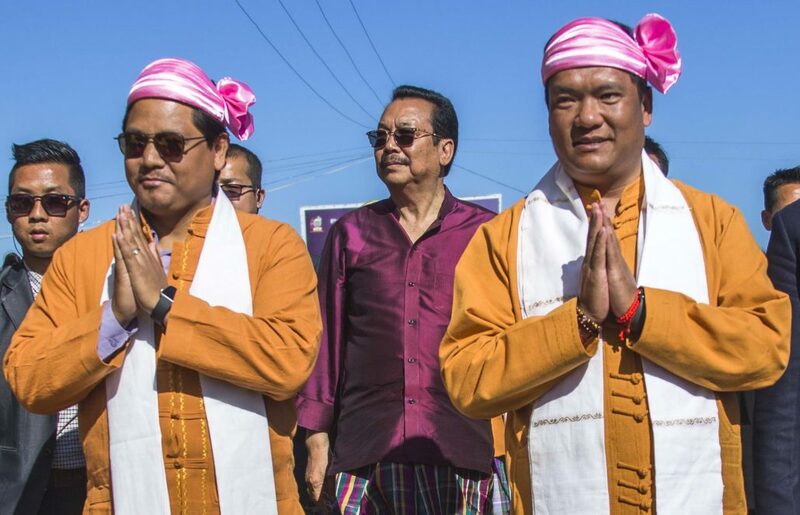 Arunachal Pradesh Chief Minister Pema Khandu on Saturday attended the Poi Pee Mau – the New Year festival of the Tai community – here along with Meghalaya Chief Minister Conrad Sangma. Khandu on the occasion also launched the Arunachal Rising Campaign and handed over cash prizes and certificates to best performing ASHA workers, Anganwadi workers, progressive farmers and the winners of the essay writing competition conducted across the district. Earlier, Chief Minister Khandu laid the foundation stone for Greenfield Science College at Piyong, ITI Piyong, a public road from BRO Road to Philobari to be constructed under PMGSY and girls hostel for Government Higher Secondary School at Namsai. Khandu in his speech said that due to rigorous campaign under Sarkar Aapke Dwar, people are becoming aware of the central and state flagship programme and are availing benefits. He said, the Arunachal Rising Campaign has been aimed at bridging the gap between public and the Government and lauded the local administration for reaching out to maximum beneficiaries. Chief Minister Khandu also said in Arunachal, over 150 such camps have been organised with more than 3 lakh beneficiaries benefitted. He said in the coming statehood day best five performing districts in conducting Sarkar Aapke Dwar will be awarded. Responding to a public memorandum, Chief Minister Khandu assured of sanctioning for creation of posts for teachers to teach Tai Khamti language and said by next session the teachers would be made available. Khandu also assured to sanction for developing the Poi Pee Mai ground at Nalung to construct a gallery and for developing other infrastructures. He also assured for construction of a state guest house in Namsai that will address the accommodation issues of visitors visiting for official purposes as the town is the nerve of administrative centre of east Arunachal. Chief Minister Sangma, deputy chief minister Chowna Mein, BJP State president Tapir Gao and MLAs Zingnu Namchoom and C T Mein also spoke on the occasion.